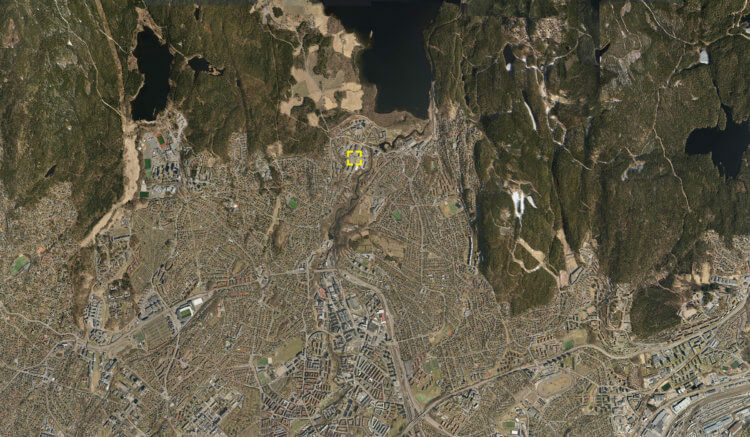 3RW arkitekter in collaboration with NORD Architects have completed a study for Frysja, in the larger Oslo region. The proposal builds upon integrating the local ecosystems into high-quality public spaces, while the architectural project (a school) is based on an analysis of the landscape features and opportunities found on site. For this assignment, Oslo Kommune asked for the design of a large open square, various street profiles, a school and a bridge over the Akerselva stream. The proposed project includes a network of distinctive architectural objects and sunny outdoors areas, linked directly to the streets and the green zones along the river. In this scenario, the school’s pedagogical infrastructures extend into the urban and natural fabrics. The proposal also defines a wide range of learning hubs scattered around the streets and in the varying Frysja landscape: each hub taking advantage of local conditions and resources, ensuring durable site connections and accentuating Frysja’s distinctive character. This aspect is key to strengthen the attractiveness of the area for its current and future residents, as well as for inhabitants of the Greater Oslo region. We believe that the emerging district of Frysja (with a focus on Maridalsvannet, Nordmarka and Akerselven) holds the potential to become Norway’s best school environment: the entire district is understood as a large classroom. Simultaneously, the school acts as a catalyst, complementing the area with a new and unique identity. The proposal stresses that the area’s functions and educational programs should be developed in a way that benefits local residents, school students and teachers while also becoming a destination for learning, play and recreation for everyone in Oslo. The primary school building performs as an extension of the urban public. The beautiful, sloping roofs of the school fold up and down, and tie together with the public space. Architecture here transforms into a living landscape, with playful surfaces accessible to the school and the area users. Main features of the school include a basketball court, a log playground, a greenhouse, swings, an amphitheatre, a parkour zone and football pitch. Frysja’s bridge is an infrastructural element that doubles down as a learning hub. It has two levels. The upper one is used as a cycle lane, with bikes going in both directions, with a small sidewalk portion, while the lower one is only meant for pedestrian circulation, acting as an extension of the larger public space. Though both levels are made of steel, their respective formal qualities (linear and zigzag) allow for a natural distinction between the two levels’ use. Program Masterplan for the outdoor public area of Frysja; creation of streetscape and a primary access ‘Allmenningen’ with emphasis on sustainable strategy for the site; pedestrian bridge crossing the river on the east border of the site; development of a new learning landscape with a school, student facilities, gardens, sport fields; additional proposal for a mixed-use residential cluster.